Jews are a compassionate people, taught to be sensitive to the feelings (both physical and emotional) of others. This sense of compassion is not only limited to human beings, but also extends to the treatment of animals and serves as one of the driving forces behind the laws of kashrut. Whether the animal in question be a quadruped or of the avian variety, shechitah or ritual slaughter, always entails a sharp and unblemished knife to be used in the swiftest manner possible. The Torah mandates this type of humane slaughter to ensure the animal suffers neither fear, nor physical pain during the process, thus respecting the creature, as well as the man, woman or child who will come to rely on it for sustenance. Given Judaism’s sensitivity for all living things, a Polish court’s recent decision to ban kosher slaughter, due to its alleged “cruelty” seems all the more ironic. Despite the court’s ruling however, Poland’s government insists that the European Union rules will still allow the practice of ritual slaughter and that the move was largely symbolic (another disturbing move given Poland’s decimated Jewish population as well as its long history of anti-Semitism). The new law is also to be applied to those of the Muslim faith who slaughter in accordance to “Halal”, which may not be as painless as kosher slaughter due to the differences in methods employed. According to Arutz Sheva, Poland’s symbolic ruling, which is set to go into effect January 1, will on the same day be trumped by an EU directive that allows for and lays out rules for kosher and Halal production across all 27-member nations. Adding to the confusion, Piotr Kadlcik, president of the Union of Jewish Communities in Poland, told the Jewish Telegraphic Agency that kosher slaughter is indeed permitted under the 1997 Law on Regulating the Relations between the State and the Union of Jewish Communities in Poland. Thus, if Poland attempts to enact the ban, the country could very well be found in breach of EU laws on religious freedom. “It appears there is a legal contradiction here and it is too early to tell what this means…we are seeking legal advice on this”, Kadlcik told JTA. Rabbi Pinchas Goldschmidt, President of the Conference of European Rabbis (CER) explained that he is troubled by Poland’s move, but believes the country’s president is on their side. “This latest development in Poland is a deeply troubling challenge to a fundamental cornerstone of Jewish religious practice and yet we know from the CER’s most recent meeting with President Bronisław Komorowski that the political will to protect shechitah is there,” Rabbi Goldschmidt stated. Animal rights activists, however, are singing a different tune, their arguments hinging on the fact that since kosher slaughter does not entail stunning the animal prior to slaughter, the process is therefore inhumane. “It’s up to us to decide whether we want a law authorizing this kind of slaughter or not,” Dariusz Gzyra of the animal rights group Empatia told AFP. Still, some who are intimately familiar with animal welfare and the slaughter-process know better. Temple Grandin, a doctor of animal science, best known for revolutionizing humane livestock handling processes — even for kosher slaughterhouses — does not believe shechitah is the problem at all, but rather the way in which some slaughterhouses (both kosher and non-kosher) physically restrain their animals prior to slaughter. She found that if restrained properly, the animal is calm and seems quite comfortable. Grandin, explained in her book Thinking in Pictures, and Other Reports Prom My Life with Autism, also views the slaughtering process as a sacred one that should be done according to high moral standards like the ones found in kosher slaughterhouses. Since 1997 Poland has had an inconsistent history on its laws concerning ritual slaughter, ultimately acquiescing to that which is mandated by the EU. Nonetheless, Arutz Sheva also reports that Poland is a leading producer of both kosher and halal meat for export in Europe. 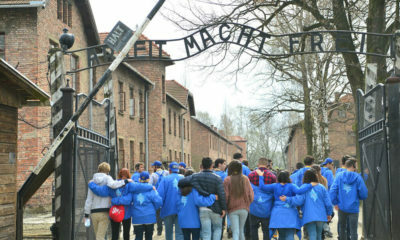 In a country where 90% of its Jewish population perished in the Holocaust, and given Poland’s tarnished history of anti-Semitism, one would think its leaders would everything in their power to exercise appropriate sensitivity and avoid the very “symbolism” the ban intended to convey in the first place.